Robert G "Bob" Lemon was born in San Bernardino, California on September 22, 1920. 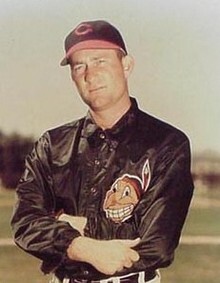 He was signed by the Cleveland Indians as a third baseman in 1938, and played in their minor league system until entering military service with the Navy in 1943. Lemon played one season for the San Diego Padres in the Pacific Coast league after his major league career ended. He later managed the Royals, White Sox and Yankees and also served as a scout with the Yankees' organization.